As a miniature doll artist I usually make lovely women dressed in historical costumes. Then a valued customer asked me to make her a Dr. Frankenstein based on Vincent Price and his helper based on Peter Lorre. I don't do "custom" dolls but I agreed to for her. That resulted in a passion for making "creepy people" and it was so much fun that I went onto to make a Vampire couple, some witches, a Zombie, a Ghost couple, and various body parts. 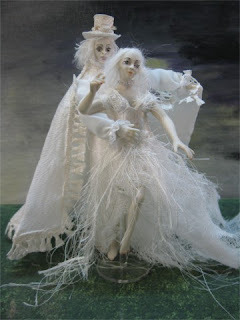 The Vampire couple and Dr. Frankenstein vignette have sold but can be viewed on my website. I still have several creepy people bouncing around in my head but for now, I am back to making beautiful young ladies so they will have to wait until next Halloween to be set free. 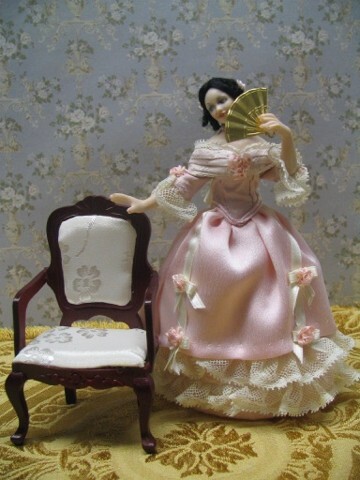 The photo below shows one of my pretty ladies based on the 1800's Godey Magazine Ladies currently for sale on my website.